Jingles was a great horse. He was young, but fairly gentle, and coming along in training as a good cowhorse. But one day, he wouldn't let his owner slide the bridle over his ears. No matter what she did, Jingles thwarted her at every turn. He even nipped at her. The next day, Jingles reared up and struck out when she approached. He shook his head, bared his teeth, and made deep discontented noises. The vet was called to examine Jingles, but he was so wild, he was tranquilized first. And as he looked the horse over, the vet found something strange. Three huge ticks were embedded deep inside one of Jingles' ears. Those ticks, feeding uninterrupted inside his ear, were the reason he was acting crazy. The vet removed the ticks and put them in a jar for us kids to look at...they were each the size of a large marble! Some animals are at a big disadvantage when it comes to keeping their skin clear of parasites like those ticks. Fleas, ticks, and other blood-sucking creatures can attach themselves in places that are just plain impossible to reach. Inside the ear, like Jingles. At the back of the neck. Even between the teeth. What is a poor animal to do? God, however, thinks of everything. He made "cleaners"; animals that feed on parasites by picking them off other animals. 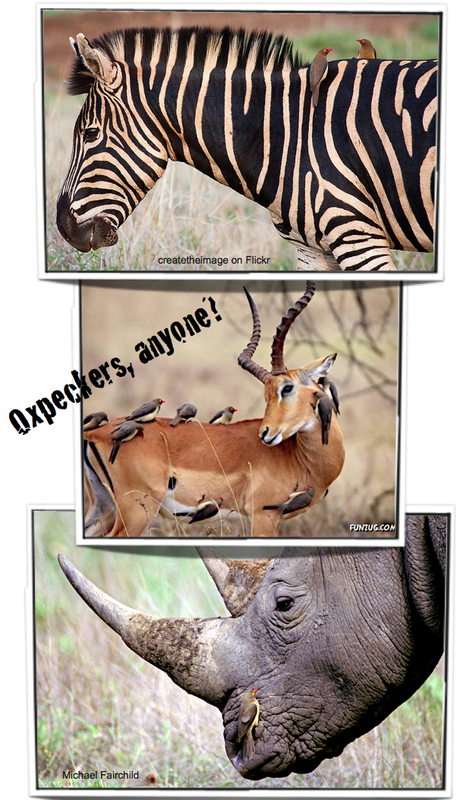 Oxpeckers will clean pretty much any animal; giraffes, elephants... even hippos. They get inside ears, around eyes, under the belly; anywhere there's a parasite. 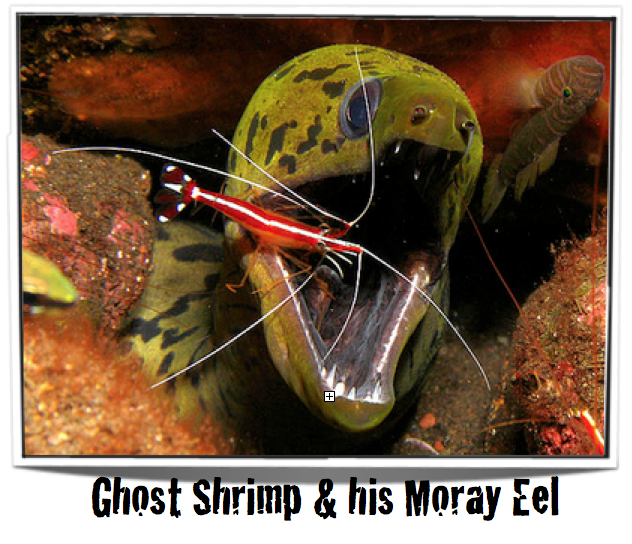 Ghost shrimp are cheeky enough to clean around big toothy mouths as well. Certain shrimp actually set up "cleaning stations", where fish come to be rid of their parasites. Remoras, however, are the cleaning "thrill-seekers"! 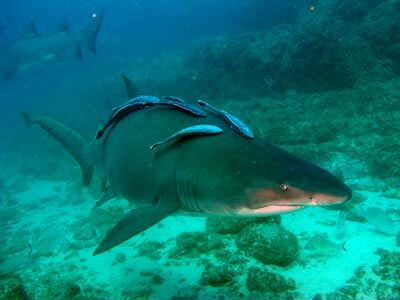 They attach themselves to sharks and whales, manta rays and whale sharks, cleaning them of bad stuff. Giant sunfish are pelagic...that means they cruise the deep oceans; so some pretty weird creatures can attach themselves to their skin. 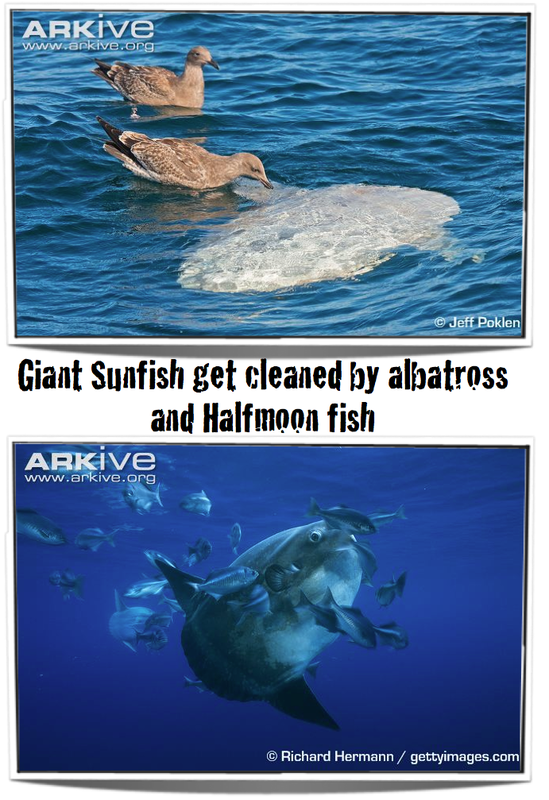 To get rid of them, sunfish rise to the ocean surface and lay on their sides to entice gulls and albatross to pick off the parasites. Moonfish will do the same job for them underwater. 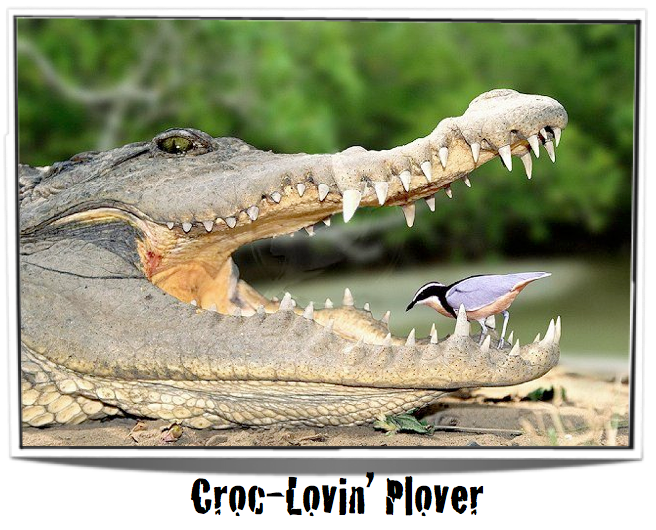 Yep, that plover is nuts. But the big question I have is, why aren't the toothier animals tempted to just eat their "cleaners" for lunch? Any ideas? Leave me a comment!